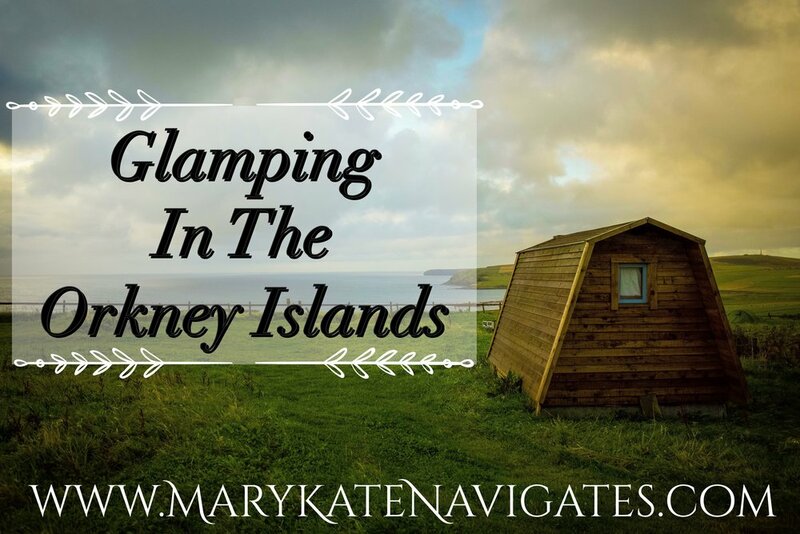 Months before our trip to Scotland, I randomly found an adorable farm on Orkney that has camping pods, a yurt, a cottage, and also areas for tent camping or RV's. Wheems Organic Farm is located on the east coast of the South Ronaldsay island. The views from Wheems were unbelievable! It's high up on a cliff with incredible views - the North Sea on one side and gorgeous rolling hills on the other. It really doesn't get much better than that. When we arrived at Wheems, we met with the manager, Islay. She was so genuinely kind and welcoming. We immediately felt at home and were so happy we chose to spend our time on Orkney at their adorable farm. We had originally planned on tent camping at their property, but because of the torrential rain and gale force winds, we opted for one of their camping pods. Thankfully they actually had one available. This was our first camping pod experience and it was wonderful! The pod was so warm and cozy - totally perfect for a cold and rainy night! Islay gave us a quick tour of the property and we unpacked some of our stuff into our adorable camping pod. At Wheems, there is a communal area with bathrooms, a kitchen, and an adorable seating area. There are fresh organic vegetables for sale and an honesty shop with some other grocery items available for purchase. Truthfully, we were just so incredibly happy to have a roof over our heads for the night because the weather was so bad, but we really were so impressed with Wheems. It completely exceeded any expectations we had. It has that remote feel that we were wanting, but it is also easily accessible from the main city on Orkney, Kirkwall. It has such a friendly and cozy atmosphere. Wheems was one of the most memorable and unique places we stayed at in the UK. Even though the weather was absolutely terrible, our night on Orkney turned out to be one of our favorites. The stormy night turned into a beautiful sunrise so I was able to get some pictures of this adorable farm before we had to catch the ferry back to John O' Groats. If we ever go back to Orkney, we would not hesitate to book our stay at Wheems Organic Farm! Check their website for lodging options & availability. Also check out our incredible Dinner Adventure at Skerries Bistro and the rest of our Adventures in the Orkney Islands!